Especially to the dairy farmer, moles can create immense problems on farms. Literature on the subject of mole hills in a silo crop says that one mole hill gathered can destroy a cubic metre of silo? While trapping a farm, once the traps have been set, we return to check and empty and reset the traps. 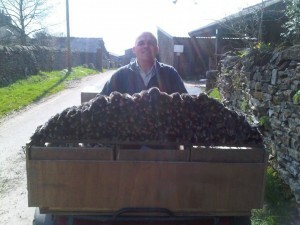 Any moles caught on a farm are left on the farm so that the farmer can see the progress of our team’s work. 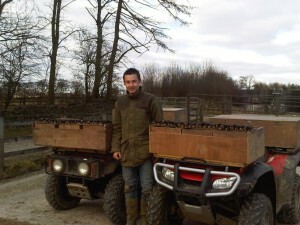 We use quads with specially designed boxes fitted to them for carrying out our work. Trapping moles is a fascinating job to carry out; different weather and ground conditions make the job harder or easier. Quite often on a farm there will usually be one mole that endeavours to give us the run around by filling the traps full of soil, but we have a few tricks up our sleeve to ensure that it doesn’t outwit us for long. While carrying out work on farms for moles we usually like to be supplied with a farm map with the fields that the farmer requires trapping marked on. It means that we can operate our plan of the clear up operation far more easily and also saves time on site discussing which fields require “trapping up” and which don’t. Usually when carrying out mole trapping on a farm we suggest that the whole farm is covered by ourselves. What we term “invisible” moles, they can just be running underneath hedgerows and fence lines and not really be noticed by a farmer tending the fields. Obviously if left, these can breed up to provide more moles for another year. Two of our technicians:- Paul with a sizeable day’s catch, and Adam beside the quads with our specially designed boxes ready for action!